While 2015 was a busy year in terms of projects and startups, there is not a doubt that 2016 is/going to be a hard-hitting year for tissue producers in the Middle East and North Africa .The winds are indeed blowing where the ships do not wish to go, and a general sense of uncertainty and vulnerability has started to sink among the industry’s major players in the region. Head-to-head competition already started with the ongoing decline in tissue jumbo rolls prices. Algeria’s Faderco, remains the most active in the local hygiene industry. Founded as a converting factory for tissue and absorbent hygiene products, the company came into tissue manufacturing with a 30,000 tons per year tissue machine that started in the last quarter of 2015. Hayat Kimya has started its fifth tissue machine at its new location in Tarsus/Mersin, south of Turkey, with a production capacity of 70,000 tons per year. Ipek chose to install its fourth tissue machine at the Manisa converting facility in Turkey, adding another 70,000 tons per year of tissue. With the new NTT machine at Abu Dhabi National Paper Mill in Abu Dhabi – UAE, the mill is going to increase its current production capacity to 93,000 tons per year. The NTT machine can deliver high absorbency, high softness and high bulk products, however the market is not yet prepared for these quality specifications. Therefore there is a possibility it will be operated as a conventional machine while waiting for the market demand to mature. 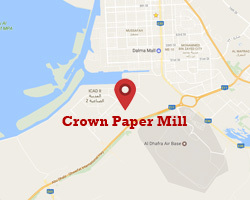 The acquisition of the Crown Paper Mill in Abu Dhabi, UAE, by Ittihad International Investment, is the first milestone in what is seen as a new trend that may develop further in the coming years with many other acquisitions currently being discussed. Crown Paper Mill was established in 1996 and partially owned by the Gulf Investment Corporation (GIC). Since 2010, the mill operates two machines with a total capacity of 30,000 tons of tissues per year. With this acquisition, Ittihad group secures an immediate position in the regional tissue market despite being a new joiner. The company plans further expansion in tissue manufacturing in 2017. The Expansion plans of Hayat Kimya Group in Egypt are on track with a 70,000 tons per year Valmet tissue machine being installed at the group’s new site in Ain Sokhn. The startup of the tissue machine is scheduled at the end of 2016. Hayat Kimya operates in Egypt since 2012, as Hayat Egypt Hygienic Products S.A.E producing baby diapers under the Moflix brand. The tissue converting company, Al Faris Group in Saudi Arabia, has already contracted Papcel for the supply of its new tissue machine. Handy – Alex Converta in Egypt stopped its production in 2015 and the ownership of the mill has been transferred to the Habibco Trade Company. Other projects are in the idle phase, including Gulf Paper Industries Factory project in Saudi Arabia, PMI project in Algeria and Ackef Pack project in Egypt. It is difficult to predict when we will see an end to this rollercoaster of change, especially with the region’s ongoing social and economic unrest. However and although the ripples of regional struggles have reached the tissue market, the situation has not been drastically affected and growth is still seen in some parts. In such conditions, many operators and investors would try to quietly observe the situation and potentially move any plans until after the second quarter of 2016.